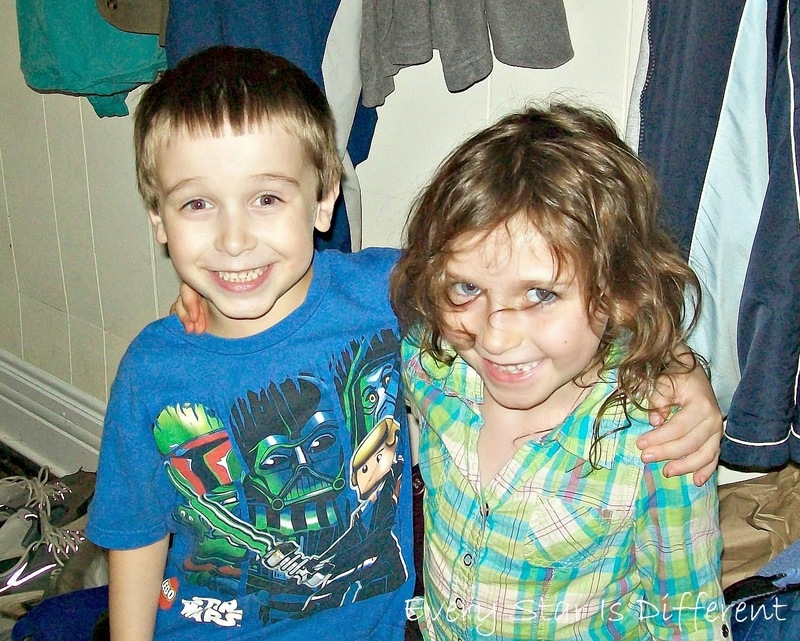 As some of you know, we had a fun birthday party this weekend, to celebrate the birthdays of all four of our children. Two have birthdays in July and August. The other two have birthdays in November and January. This has been the second or third year we've done all four birthday celebrations at one time. I must say I LOVE celebrating this way. No one feels left out. It's only one party for those who live a further distance away, and I can choose a month when there's nice weather. However, with that said the temperature yesterday was a high of 56 degrees with a 90% chance of rain all day. We had intentions of having the party earlier in the summer, however both times we started the process of planning etc., it fell through. Even plans to have a party with my extended family fell through due to me having an allergy attack on our visit to where they live. So, extended family had already given gifts to the kiddos. I had pretty much given up on the idea of having a party this year. 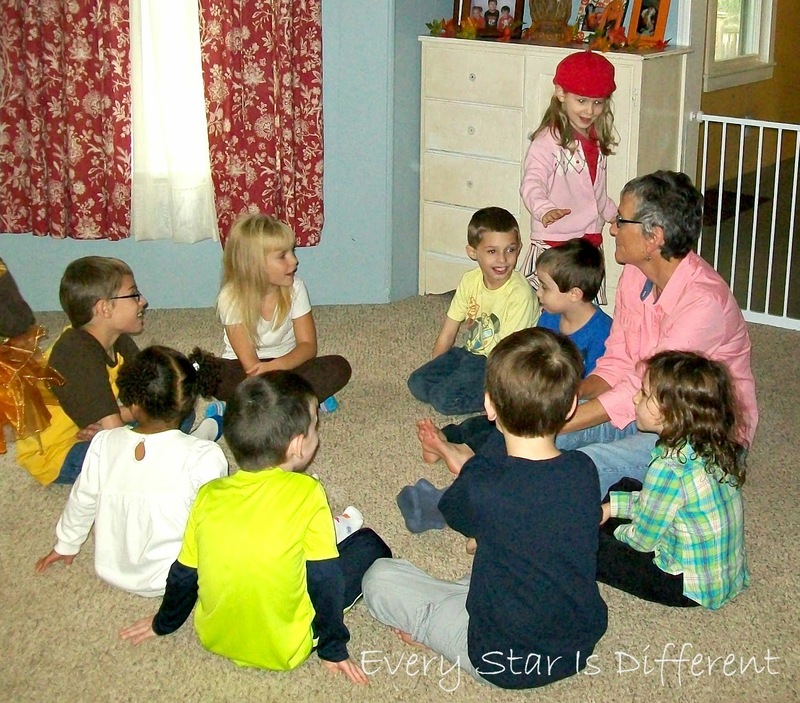 Over the past two weeks the boys spent time with several of their friends that we had planned to invite to the party. All of them asked when it would be. I felt bad. It was then, I realized the party wasn't just about my kiddos, but about their friends having a chance to come to our home and do something fun. One week ago, (Sunday night) after speaking with my husband, I decided to see if their friends had plans for the upcoming Saturday, and if they'd be able to come to a party in the afternoon. All but one family was willing and able. So, I finalized everything and put together a Fall Kickoff Party for all four kiddos in six days. 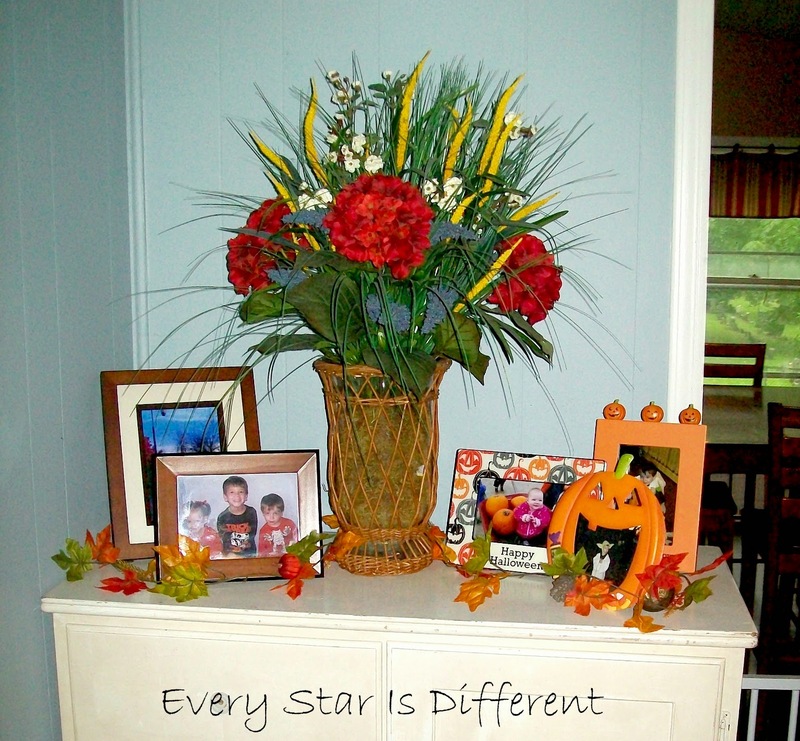 Each kiddo chose their own fall theme. Dinomite chose football. Bulldozer chose pumpkins. Princess chose apples. And for Sunshine I chose a squirrel theme because she's so obsessed with them. The four kiddos helped with every single detail! So I wouldn't drive myself mad with planning and preparing, I asked each one of the kiddos, what mattered most to them in regards to their party. Dinomite said he wanted decorations. Bulldozer said he wanted lots of treats. Princess was all about her attire. (You'll notice the girls are wearing attire that go along with their themes.) Sunshine just repeated everything her older siblings said. Lol. I focused mainly on these three things. Knowing I couldn't do everything on my own, and that Jason was going to be working the entire day up to the party, and for the first 30 minutes into the party, I enlisted the help of a grandparent who lives very close by. She was more than willing to help! Each day or night we'd chat on the phone discussing plans, what we'd found etc. It was so much fun. My husband was super supportive as I was gone almost every night this past week, baking all day, leaving the kitchen a mess when I left. Every night I came home to a clean kitchen. In the end, we threw an amazing party that everyone seemed to enjoy. The kiddos worked so hard every single day this week, planning, preparing, creating, baking, etc. Here's what it looked like in pictures! Dinomite has always been one big on decorations. I remember a few years ago, around the Christmas season he was so upset because we didn't have enough Christmas decorations. He's felt the same way around Halloween etc. Each time this happens, he'll go shopping with me to find the "perfect" decorations to put in our home. He's a boy after my own heart! As we went shopping this week, he was no different. He found football field dish towels, used as part of his table spread. (I needed new dish towels anyways, so I decided the purchase would be okay.) At another store he found a package of all of the NFL team helmets. I allowed the purchase because I knew we could use the helmets for more than just the party. Hint: Our learning time unit for next week has been changed from The Doctor's Office to Football. Then of course we had to have a football. Dinomite went with me to every store looking for the cheapest one. Since the purchase, he's slept with it, carried it everywhere, and played with it outside with Daddy. The last thing on his list of decorations was a banner or streamers of sorts. I found some fabulous football scrapbooking paper at the local craft store. He cut out all of the strands to make the decoration you see above. Since I'm limited in funds for decorations for every holiday and season, a few years back, I decided I would use pictures of our family to decorate our home for the seasons. Each season I switch out photos in our living room and add a few small holiday tokens. 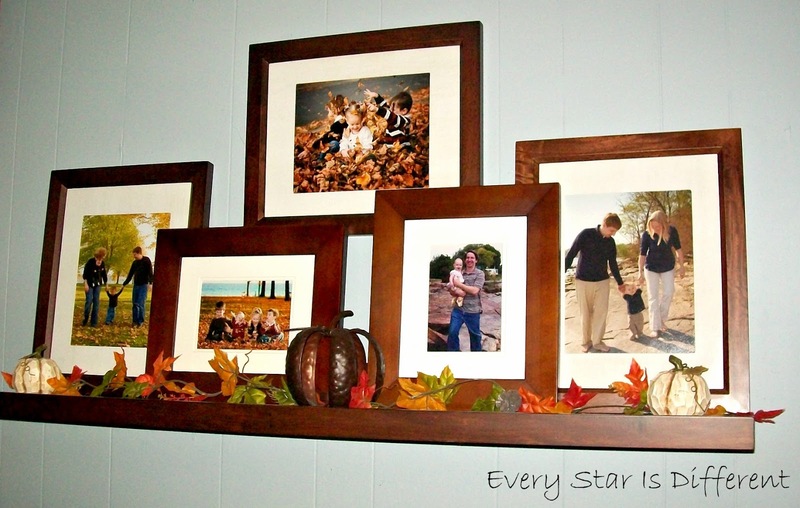 This is great incentive to take pictures of our family during every season and event. The Fall Kickoff Party was great motivation to get out our fall photos and decorations. They went perfectly with our theme! The focal point of our living room is the picture collage above. I love how it includes pictures of our family from the time Dinomite was just 9 months old, to the present. Also in the living room is our Halloween Corner. It's missing a couple pictures, but still looks fabulous. (I need to find a few more frames.) The kiddos love looking at pictures of themselves. Halloween is one of their favorite holidays! Decorations didn't stop in the living room, but continued on in the kitchen. 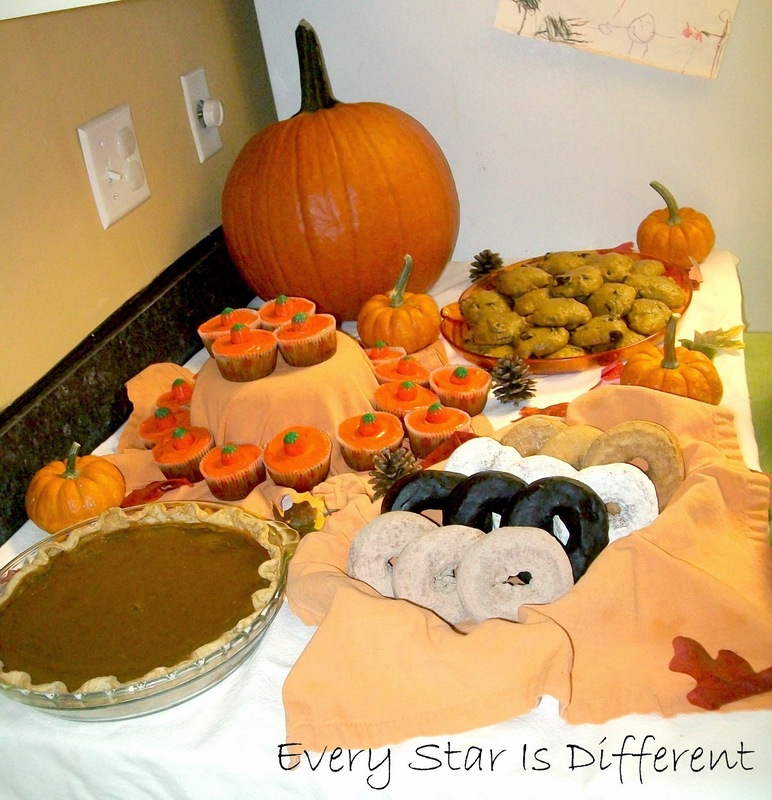 Each kiddo chose four treats they wanted at their party, and then helped prepare them all. 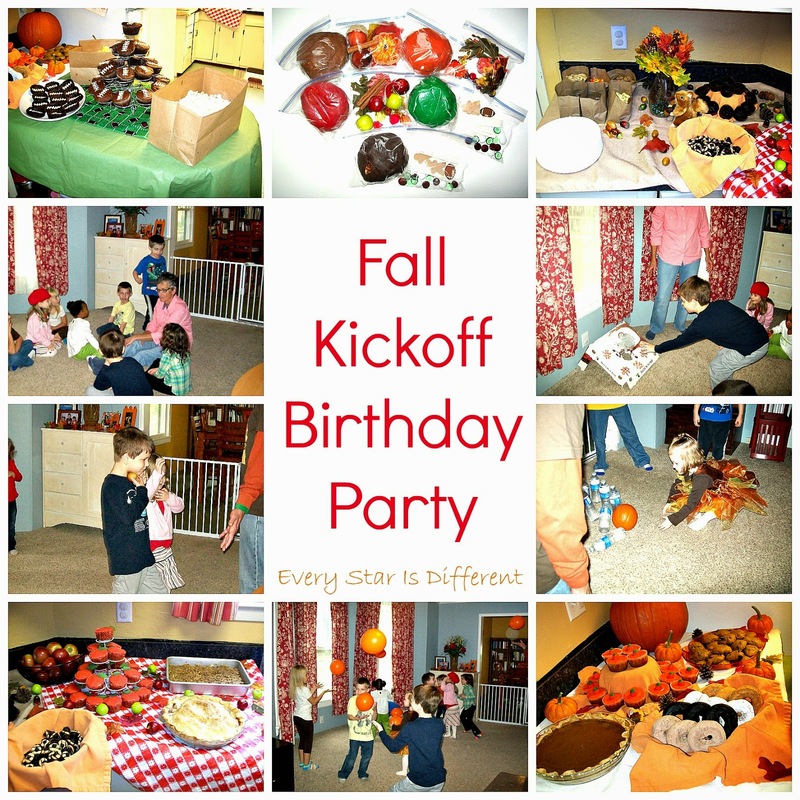 We tried to relate the treats back to each kiddos' theme, as well as the Fall Kickoff theme of the party. I am so pleased with how everything turned out. 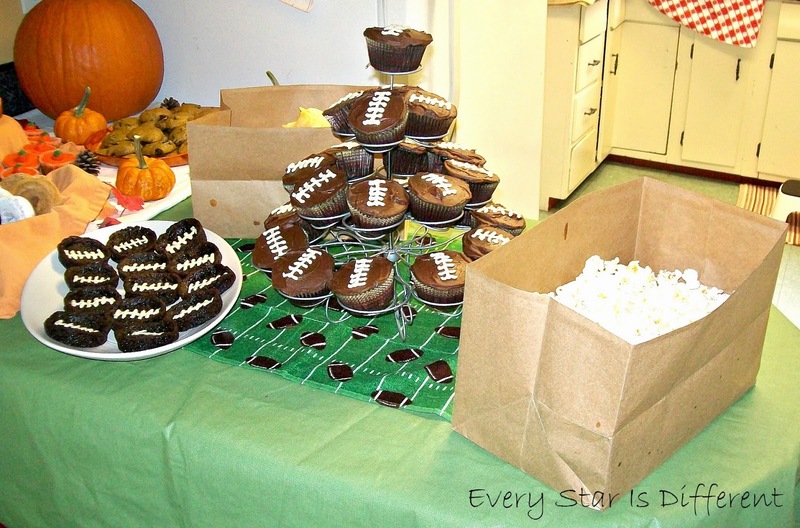 Dinomite chose football brownies, popcorn, potato chips, and chocolate football cupcakes. Note: Dinomite picked out the football dish towel under the cupcakes. A grandparent lent us the table cloth. The popcorn and chips are in a simple paper grocery bags, trimmed down. Bulldozer was all too excited to help make treats for those coming to the party. He helped make pumpkin cupcakes with cream cheese frosting, pumpkin pie, and chocolate chunk pumpkin cookies. Had we been able to have the party outside, we were going to do doughnuts on a string game. Since we were inside, I added the doughnuts to his table. Bulldozer picked out the doughnuts, large and small pumpkins for decorations. You'll also notice leaves and pine cones scattered about. Those came from our homeschool fall bin of manipulatives. 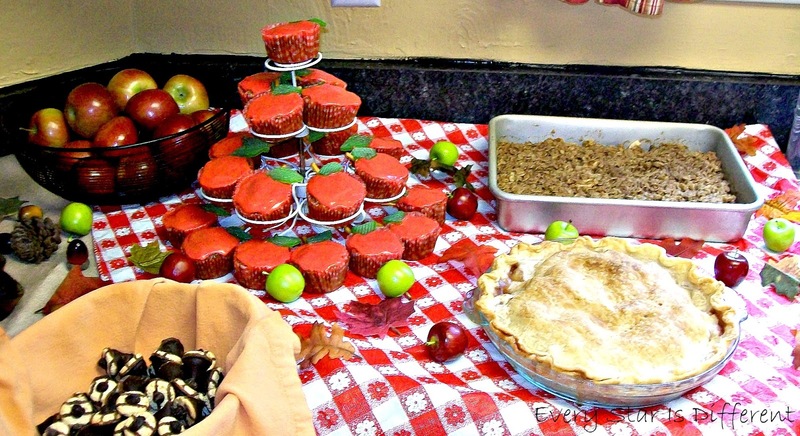 Princess requested apple pie, apple crisp, apple cupcakes with cream cheese frosting, and apples for her table. She helped make everything and LOVED the process. 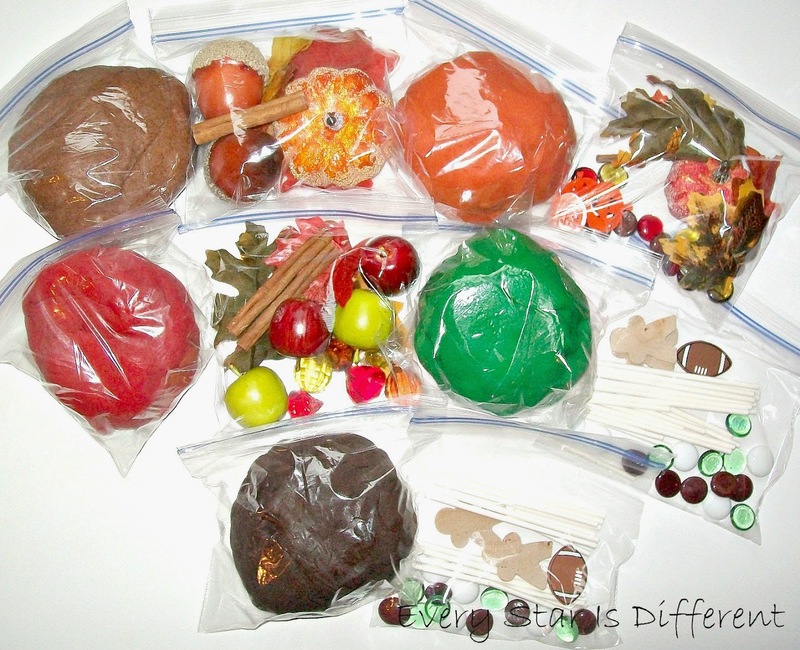 For decorations we used more manipulatives from our fall learning time bin including apples and fall leaves. The tablecloth was borrowed from a grandparent. If you like our apple cupcakes, you can check out how we made them at Makes and Takes! I loved how Sunshine's treats turned out! Sunshine helped me make her allergy friendly cupcakes. Then I made the most adorable little acorns from Hershey Kisses, chocolate chips, and Bulldozer's favorite mini cookies. They were seriously the hit of the party. To find out how easy they were to make, check out the recipe at The Hungry Housewives. I'm seriously contemplating making them as part of our Christmas treat plates! 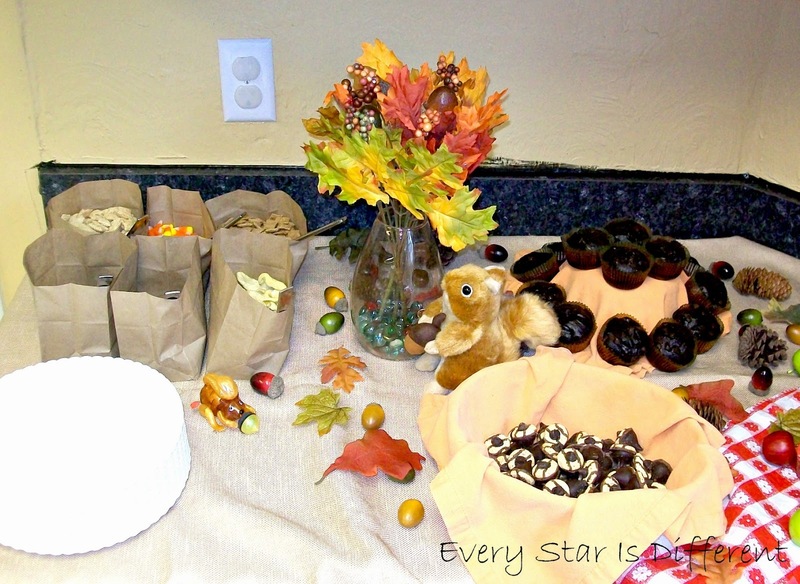 To finish off her table, I created a trail mix station. Each bag contained a different ingredient that could be combined to make a special treat. The cups for the trail mix are missing from the picture, but they went right next to the plates. For drinks we served apple cider, apple juice boxes and mini water bottles. My four kiddos aren't that fabulous with games where there are winners and losers. They're a bit sensitive about that. We tried to find games that would not cause hurt feelings. 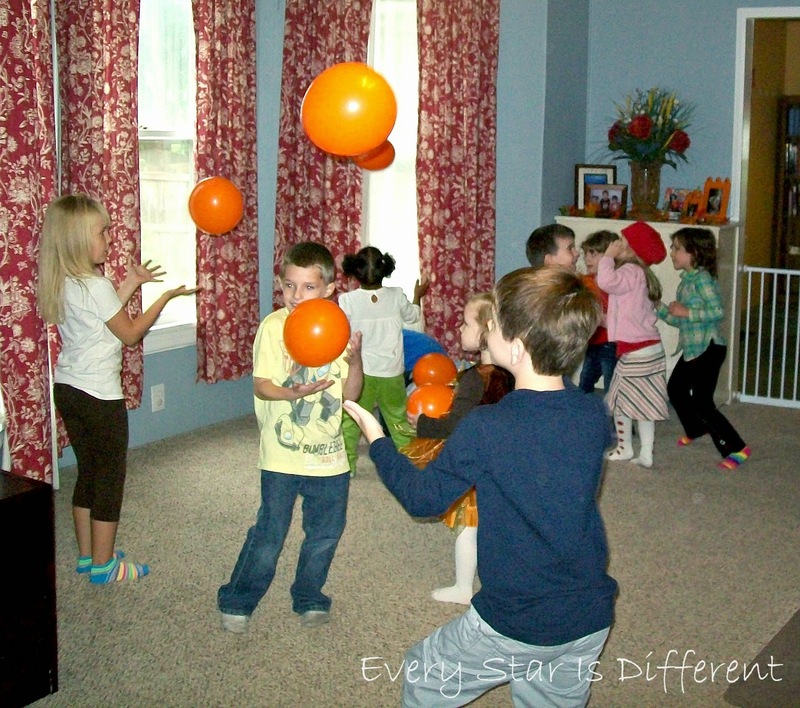 For the first game we gave all of the kiddos orange balloon "pumpkins." While fall themed music played, they needed to keep their balloons in the air. When the music stopped, they had to hold them still. If we had gone a step further, those who couldn't hold still would have been out, but we decided not to do that. Disclaimer: I did NOT create this amazing prop for our game. 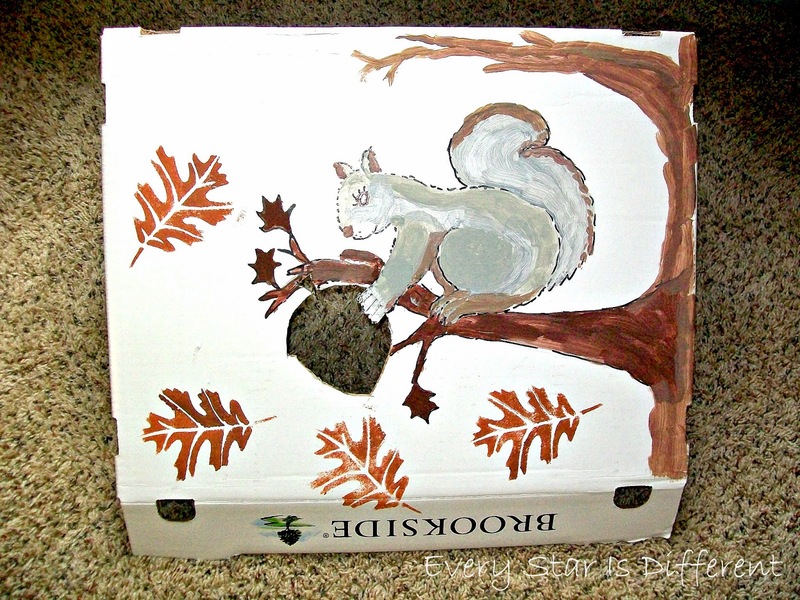 One of the kiddos' grandparents is extremely talented in the area of art, and did this, with some help stamping leaves and painting from his wife. We are truly blessed to have grandparents willing to help make birthdays so special. 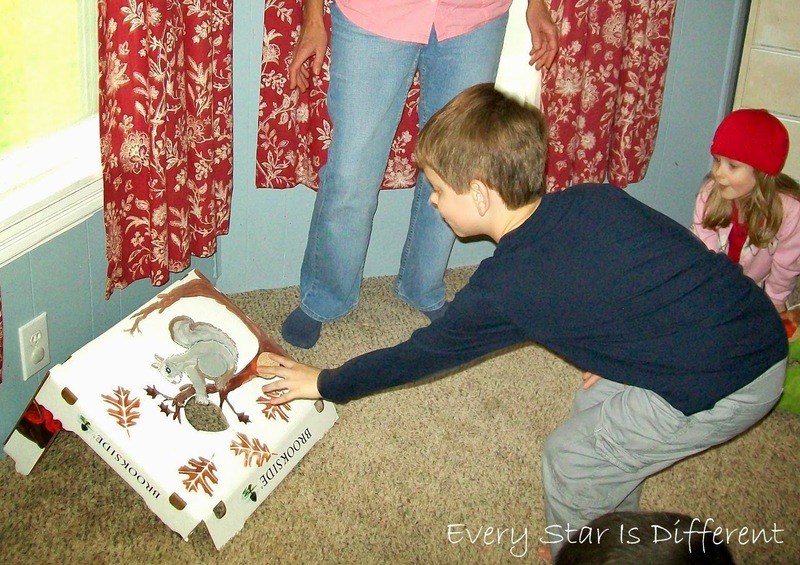 In this game the kiddos took turns trying to throw the acorn into the hole. Each time the succeeded they took a step back and tried again. The game was much harder than it looked. All had a fun time. This game was hilarious to watch. Some of the kiddos had never played Duck, Duck, Goose before. We changed the wording to go along with Dinomite's football theme. The kiddos did such a great job following directions and waiting their turn. Once again, this game was hilarious to watch. The kiddos put apples under their chins and had to carry them to a specific point, turn around and give them to their teammates. 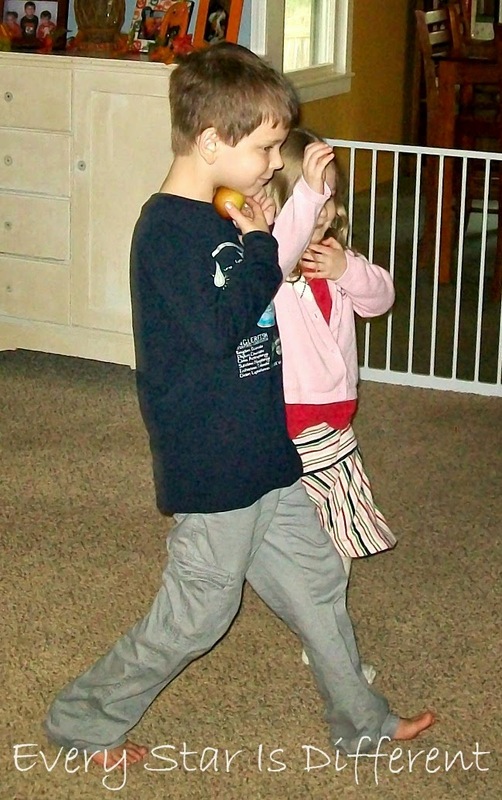 It was hilarious trying to watch kiddos carry the apples. Some just ended up holding them with their hands and chins, as shown above. Lol. This game was HUGE success! 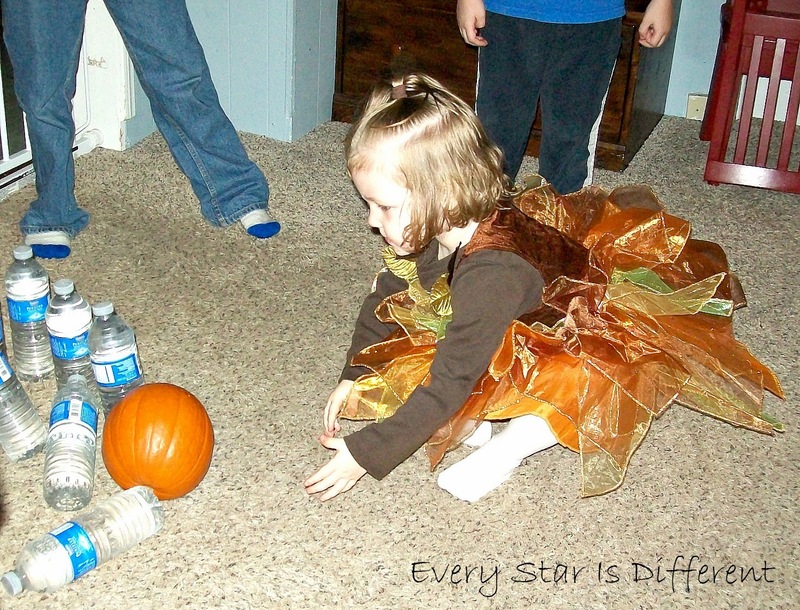 The kiddos took turns bowling with the pumpkin, knocking down as many filled water bottles as they could. The water bottles worked great on the carpet. 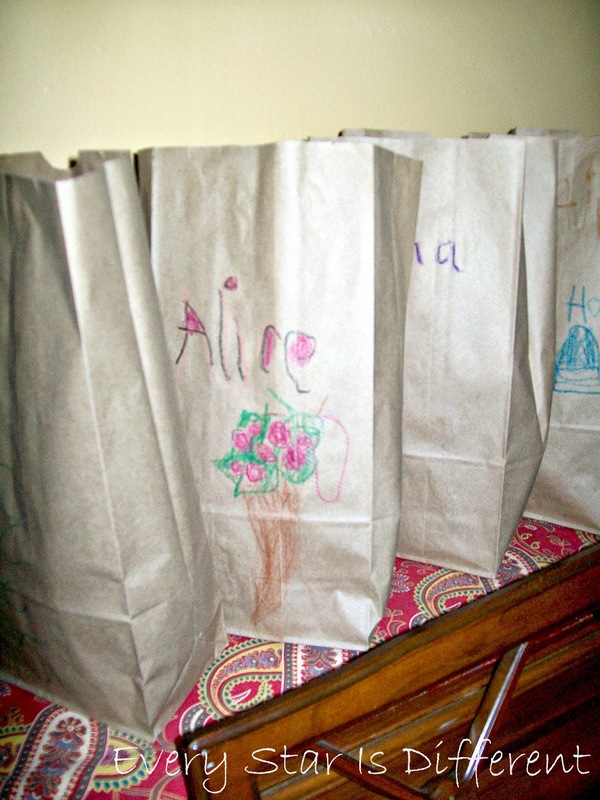 The kiddos then decorated small paper bags to put the party favors in. My favorite bag is one Princess made for her friend Alice. I love her apple tree drawing! The party was a HUGE success. Though the party was only for friends, we ended up having two sets of grandparents attend, one set who helped with the party in a BIG way, and the other a set who hadn't been able to travel to our home in almost a year, due to health concerns. We are so thankful to such fabulous friends for attending the party and celebrating with our kiddos! Here is Bulldozer with one of his closest friends! A special thank you to two special grandparents who helped plan, prepare, and host the games at the birthday party. Lastly, I'm also thankful I have a year to recover before the next big birthday bash. I'm exhausted! Lol. Oh, that is a fun theme!! I am glad everyone had a great time and you were able to have ti. Thank you for sharing at Sharing Saturday!! This looks like a fantastic birthday party! 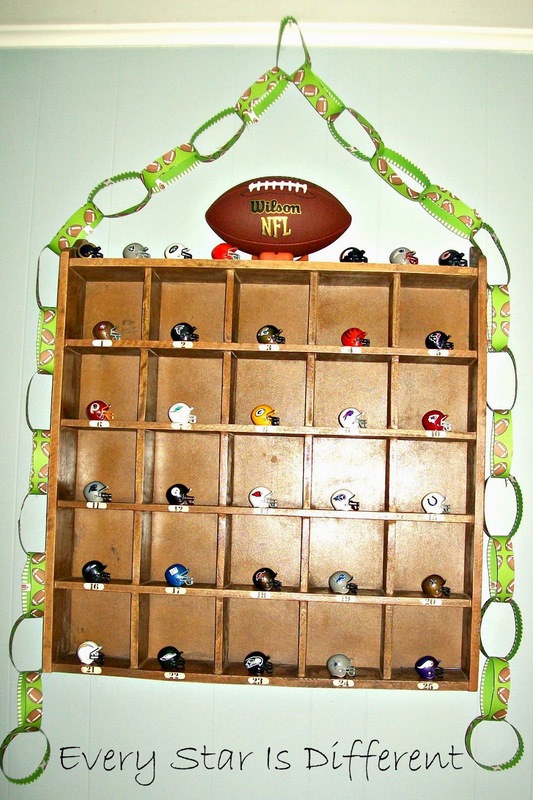 This is a great idea and I love how you were able to personalize it to each kid. I can definitely see us doing something like this in the future.